In today's used car market, that chances that you may go on a different kind of ride are increasing steadily.... in a BIG way. The term "BUYER BEWARE" is almost overused in this day and age, but it certainly can be applied in this instance. With all 3rd-Generation F-Bodies becoming popular in the marketplace, there is a definite interest in the 1987-1992 GTAs in particular. It has become well-known that 1) the GTAs were the most fully equipped F-Body models produced during the 3rdGen production run, and 2) the Third-Gen cars are on everybody's short list of still-affordable performance cars. Regardless of the source, interest in these cars are very high and show no sign of slacking off in the near future. Over the years, I have received volumes of mail from people asking me........."Hey Frank, I've found this car....... is this right, is that right......?". I have always tried to answer all that I could, but the requests still seem to keep coming in, at a surprising pace. So this section was created to assist those of you out there who are perhaps contemplating the purchase of a GTA, or maybe you are just are interested in this kind of stuff. Either way, I feel like whatever can be done to help someone be sure that their potential dream car is "on the level" will help them out in the long run. 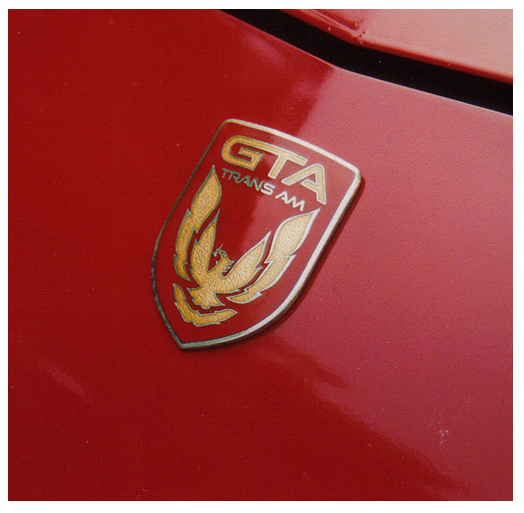 I have taken the liberty to use photos of my red 1988 GTA throughout this section, as it is still in its original, undisturbed condition throughout. I hope this doesn't offend anybody. First up.... the best motto is "A SMART SHOPPER IS A WISE SHOPPER". So let's get the worst news out in the open right up front: be aware that these cars can (and often are) duplicated so well, and to such an exacting detail, that I would be very comfortable wagering that a Pontiac enthusiast would not be able to pick out the "fake". As you will see later on, there are some things that are "make or break".... but it can most certainly be done skillfully, and many people fall prey to this trickery each year. On occasion, you will see some of the classics: the "all-original GTA" that has the mid-1970s 2ndGen metal Firebird emblems on the sail panels.... the "GTA" that has the sail panel birds on the front fenders, or on the nose.... or even the really rare "GTA" equipped with individual "letter" emblems that look like small house street numbers attached to the front fenders.... no, really.... I saw one like that one time. Seriously. Oh, yes, it can get quite comical. But one has to be on guard at all times when looking for a used GTA. To be sure, there are honest people out there that make honest mistakes on cars.... but it seems there are more people out there looking to make a fast buck at an honest person's expense. GEE, THANKS.... RIGHT? Well, what's a person to do....? Ah, read on, my friends.... read on. 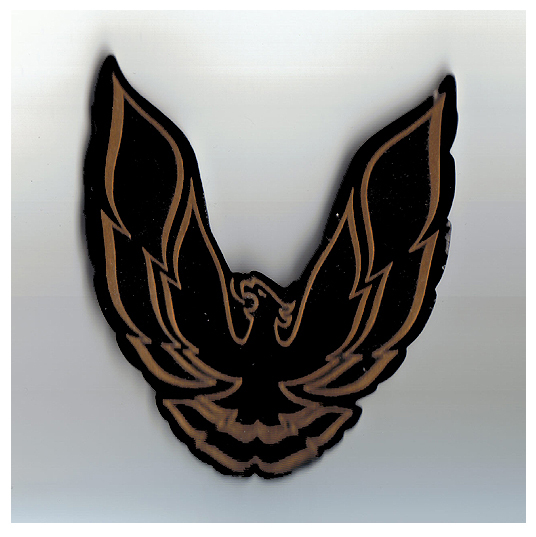 Well, in attempting to authenticate a Trans Am GTA, the first thing everybody seems to want to wave around is this.... The Vehicle Identification Number (VIN) is always the first place that a person wants to look to verify their car; unfortunately, the VIN will not tell you anything regarding whether or not the car is a factory-built GTA model, regardless of what various on-line VIN decoders will tell you. This number will tell you basic data about the production of a car, but that's about it. The picture at left is a look at one of the VINs from my red 1988 GTA. There are VIN stickers like this located in various parts throughout the car. While they were used in an attempt to help combat theft, the stickers also make it easy to notice if major parts of the car have been replaced.... as they are virtually impossible to remove without destroying them. All GTAs have basically the same VIN codes for each model year; the differences are mainly engine codes and model-year designations. Here is a "sample" VIN that would be correct for an '88 GTA. Keep in mind that the last six digits are made up as an example only, there were no GTAs built with such a high sequential production number. So as you can see, the only really pertinent information you an get from the VIN is 1) the type of original engine, and 2) the model series, Trans Am. 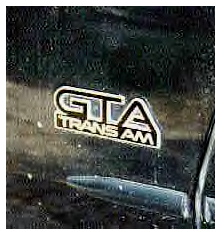 Since the GTA was technically a model option for the Trans Am, they have the same "W" code in the VIN as a regular Trans Am model. The engine code (8th Digit) can throw up a red flag immediately if you look; all GTAs were equipped with TPI engines from the factory, so look for either the "F" (5.0L) or "8" (5.7L) codes. The only problem with these designations is that these engines were also available in a regular Trans Am. So most of the time you will have to dig a little deeper into the car to be sure. Any GTA that did not have a TPI engine is one that I would pass on.... if the engine's been swapped out, then there is likely other things that have been changed as well.... and can cause big headaches (and/or big $$$) down the road. In other words.... if you pop the hood and see something other than the image at left, keep on walking. The view may be a bit different among years in regards to air intake plumbing, but you should pretty much see what's pictured. Some people have asked about information on the driver-side door decals. These labels are a dead end also; they simply tell you all about the GVW, the correct tire sizes and pressures front and rear, etc. However, this decal will tell you the build month and year for the car, which is always helpful. Many times if the car has had body or paint repair done to the door, these labels will be painted over.... or worse, missing altogether. Now, for the good stuff. As we sometimes say here in Arkansas.... let's just "cut to the chase here right off the bat". 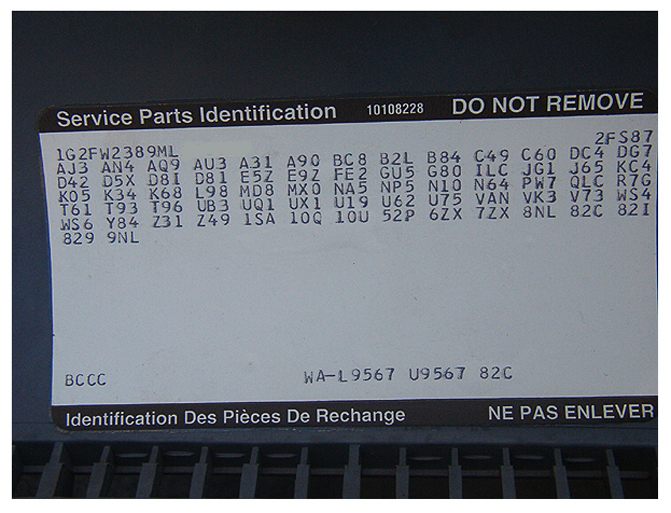 This often-elusive label is known as the Service Parts Identification (SPI) label. This sticker is applied by the factory and is used to help ensure that the proper repair parts are used on the car in the future. Every option that the car was equipped has a specific code, and that code is printed on this label. Each option, interior and exterior, is listed for future reference. 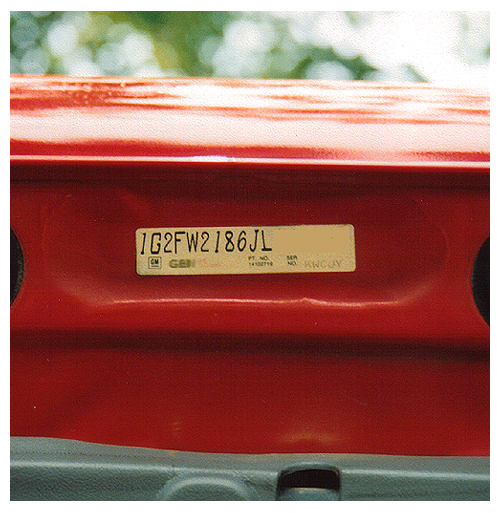 The location of this label varies according to the particular model of car it is installed on. 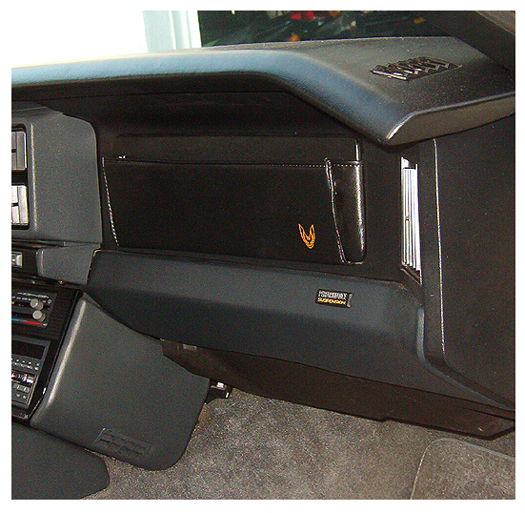 For the 1987-1990 cars, the label was placed on the inside wall of the console glove box; in turn, for 1991 and 1992, the sticker was moved into the LH rear storage compartment. The GTA option code was Y84; the code is pictured on the next-to-last line on the sticker in the picture. IF THERE IS A BE ALL/END ALL IN GTA DOCUMENTATION.... THIS IS IT. PERIOD. If the label is present, then luckily the search is short and sweet: if Y84 is there, it's a GTA. If it isn't, keep traveling........regardless of what the seller says or how convincing he/she is in saying it. The dilemma here is that people are getting "wise" to this little label and to what it represents; more times than not, it will not be in the car. As stated earlier, this is not to say that every person takes it out in an attempt to pass off a bogus car, but it does happen. Keep this fact in mind as well: since these labels are not available from GM, if you decide to purchase the car you won't be getting a replacement one, either. A missing label also requires the taking into account of other factors.... the car has passed through several owners.... is in rough shape overall.... may have simply had a console replaced.... etc., but the absence of the SPI label requires one to automatically raise their guard a few notches. Always be sure to check the VIN on the dash of the car against the VIN on the SPI label. Be watchful of your initial reactions to the car itself. If you are getting a bad vibe, consider looking elsewhere. Despite what you may hear, there are plenty of these cars still around. The process of documenting a car without the SPI label can get a lot more involved, especially if you have come across a savvy, dishonest person looking to make a buck. The only "1986 GTA" still in existence is the Type K Kammback GTA Wagon that Pontiac still maintains as part of their historic collection.... and it was originally an '85 Trans Am that was updated wit h the GTA's appearance after the cars came to market in 1987. Second - There is no such thing as a FACTORY 1991 or 1992 Trans Am GTA Convertible. * I have the factory Pontiac Firebird order sheets for 1987-1992, including the 1991-92 convertibles, and they clearly state "Convertible - Available Firebird, N/A Formula, Available Trans Am, N/A GTA". For anyone who disagrees, I will be happy to send copies of these forms for your verification. I can relate to the latter dilemma personally; several years ago, I was offered a chance to buy a supposed 1992 GTA convertible. 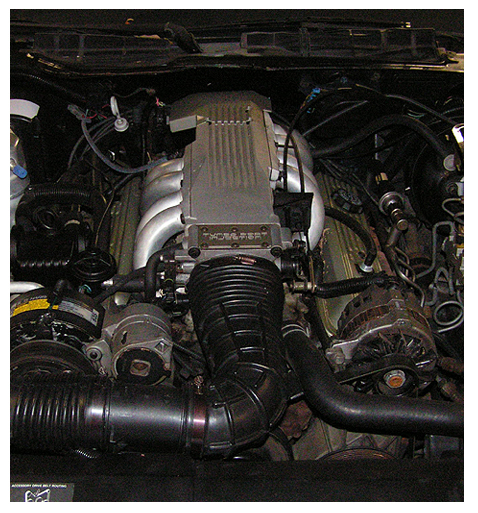 It was a beautiful black 5.0L/5-speed car with 40,000 original miles. The details were so "dead-on" that it was scary and I even again e-mailed PMD just to be sure about its authenticity. Needless to say, the owner was quite upset when I told him the truth, as he had bought the car as an authentic GTA.... for GTA money. * - There are GTA convertibles in the world, and they are real GTAs. But the 1989 ASC convertibles were the only ones to be considered "factory", as they had both an RPO code and a drop-ship code to have the cars sent to ASC for conversion after production. All others were converted after production by selling dealers or by owners. But there are cars out there that are real GTAs; when dealing with the possible purchase of one of these, it is best to again go by the Y84 GTA code for authenticity. OK, so the SPI label is not in the car....... what then? If you really want to know if the car is authentic, you can copy down the VIN and fax it to Pontiac Historic Services; they will research it for you for a small fee and give you a timely response. Of course, if you opt for the full package this process takes about two weeks...... and the car could be sold in the meantime. And if it then turns out to be a GTA, you're both out of luck and the $35 that you sent in. So for you thrifty spenders out there, the first place you can look is the exterior of the car; many people trying to pass off a lesser car as a GTA will make their first slip-ups here. By knowing what is correct and what to look for, you may save yourself some headaches (or even heartaches) later on. The first thing to check is to make sure all of the exterior badges are present and accounted for. If they are all there, then the most common mistake people will make is to not apply them in their proper place on the body. 1) This is the proper location for the front fender GTA emblem...... just above the body side molding and centered between the door edge and the front wheel opening. On the production lines, these emblems were installed using jigs for proper continuous placement.... so there was a method to the madness, so to speak. Many times the emblems will be higher up on the fender.... or too far to the front or back.... or even below the molding strip on the front fender. The picture here illustrates the proper placement. 3) This is a shot of the proper placement of the nose panel emblem. This emblem on 1987-1990 cars has a mounting stud on the back of it secured by a speed nut, so it will usually be in the right place....... unless somebody is really sloppy. The emblems on 1991-1992 cars are urethane and adhesive-backed only, but the location measurements remain the same. Some people will catch this one as being incorrect even before they notice the fender emblems. 4) This rear sail panel badge is also one place where a sloppy or an unfamiliar installation will show up.... but this is the most commonly seen location where the emblems will be out of place. In my experience, this is the location that will stick out first as being incorrect. Usually an erroneous placement will put the emblem somewhere around the center of the sail panel. The shot above shows the correct location for the emblem in relation to the door glass. Seeing that Pontiac, even to this day, has a habit of carrying their accent themes to their limits, GTAs were equipped with gold accents EVERYWHERE....... Another often overlooked accent touch is the headlamp door identification badge. 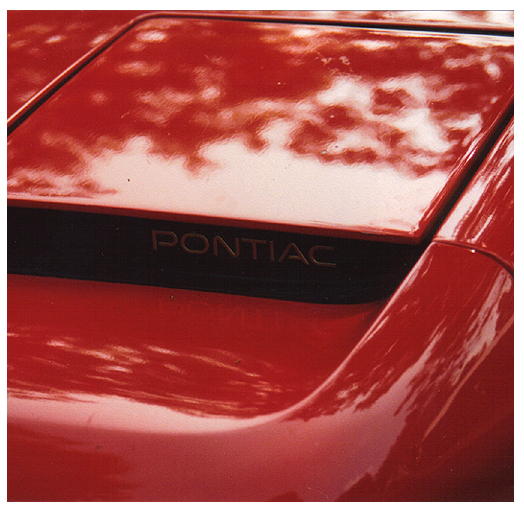 For the 1987-1990 models, even this small "P-O-N-T-I-A-C" logo was gold instead of the usual silver. Some 1987 model GTAs came without it, so it would technically be correct for an '87 to be minus the emblem...... but the 1988-90 cars should have it in place. More times than any, this will be the place of a slipup; people most of the time do not go to the trouble of changing out this emblem, and just leave the silver one in place. If it isn't there, then the car has at least had its headlight surround replaced in the past. 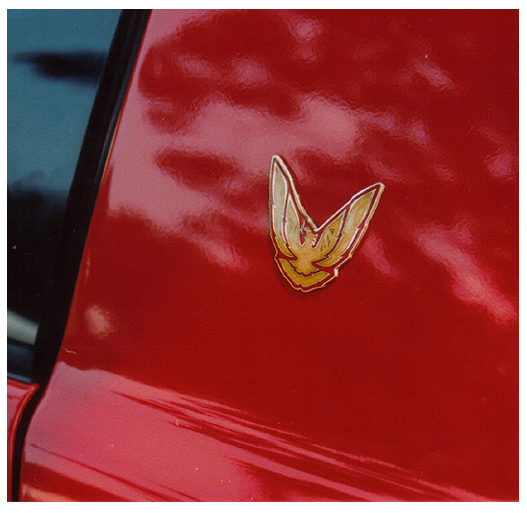 Likewise, the Firebird emblem on the rear taillight center panel was also finished in gold on these models; an example is shown at right. Other Firebird models used a silver bird here that matched the silver nameplate on the headlamp door. Many times these rear emblems will be left alone, as it can be difficult to remove without breaking the entire panel........ making for an expensive little jewel to replace! For 1991, Pontiac redesigned both the front and rear lamps, with the LH front headlamp identification changing to a recessed "PONTIAC" name embossed in the top of the headlamp door for all Firebird models; the rear lamp setup was changed for 1992 to incorporate the Pontiac name across the center of rear lamp illumination. So a 1992 without the specific taillamps could signal, for example, a car that has had rear body damage and might warrant closer scrutiny...... just something to keep in mind. 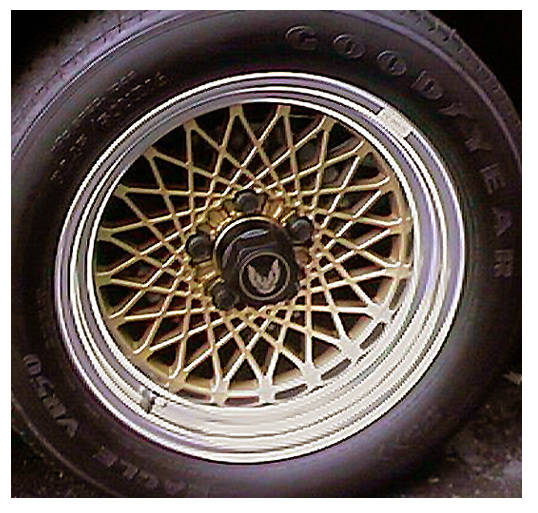 Other exterior giveaways.... Pictured is the 16" GTA gold PW7/52P diamond-spoke aluminum rim that everyone raves about. These wheels were standard on the GTAs throughout their product run of five model years. Usually the wheels are not an issue; but I have actually seen supposed GTAs for sale that have the black diamond spoke wheels on them. Sometimes you may also see differing center caps on certain cars; the photo shows the "WS6" caps that are always seen in advertisements and pictures. I personally have seen GTAs that feature the center caps with the gold Firebird emblem as well; in fact, most all 1987 GTAs had the "Firebird" center caps. It seems the cap pictured above came into wide use in 1988 and continued through 1992. 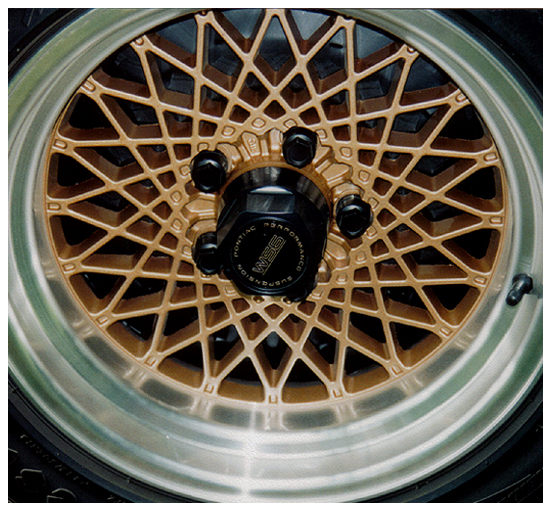 Keep in mind that most 1987 model GTAs (photo at right) will also have the "first generation" of these wheels, which do not have the small indentions at the joint of each diamond spoke where it meets the chrome rim as you can see in the photo at left of the 1988-92-style rim. These wheels are very hard to find now, as the ones now available are the 1988-92 style only. Again, the small things sometimes give clues to potential problems.... or maybe just sometime in the car's life, an owner switched the wheels and then later someone switched them back, but to the later-style rims. You have to weigh the pros and cons.... and try to make an educated decision. On another exterior note (and also a popular discussion topic), Trans Am GTAs also never had the fender air extractor vents found on regular Trans Ams. This comes into play for the 1987-90 models only, as starting in 1991 the fender vents were deleted from all Firebird models. The vents did not seem to go with the restyled aero package, so they were dropped. So any Trans Am for 1991 or 1992 could be made into a quasi-GTA very easily. Now this is not to say that some 1987-90 cars could possibly have the vents due to unforseen repairs, etc. after construction. In fact, one of 1998's GTA Spotlight cars had the fender vents due to repairs following an accident, but as a rule this should not be the case. I would be very wary of a fender-vent-equipped GTA without the proper identifying codes. 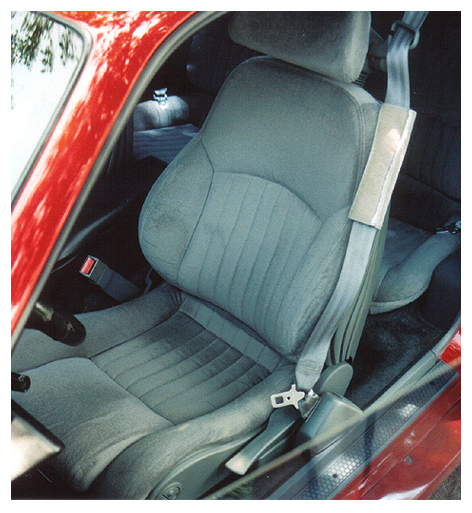 All GTAs from 1987-1992 featured the RPO AQ9 "Ultima" articulating bucket seats as standard equipment, so naturally these seats should be in the car you are looking at. They can be covered either in two types of cloth: Pallex (1987) or Metrix (1988-92), or in Ventura leather. If they are not there, find out if the buyer can tell you why they aren't. If you are still not satisfied, then move on. 4th-Generation Trans Am seats are basically the same seat with a different style headrest and trim panels; they are sometimes swapped into GTAs rather than going to the expense of recovering the original seats.... an easier task, but not correct. So you may encounter GTAs where the seats have been swapped out; keep in mind the originals will be expensive to replace, unless the owner still has them and they go with the car. But if you run onto a GTA with any other style seat.... it's been changed, and usually not for the better. The only seat better (opinion only) than the "Ultima" that was offered by Pontiac in the 3rdGen cars was the RECARO bucket seats offered from 1982-1986 on the Trans Am. 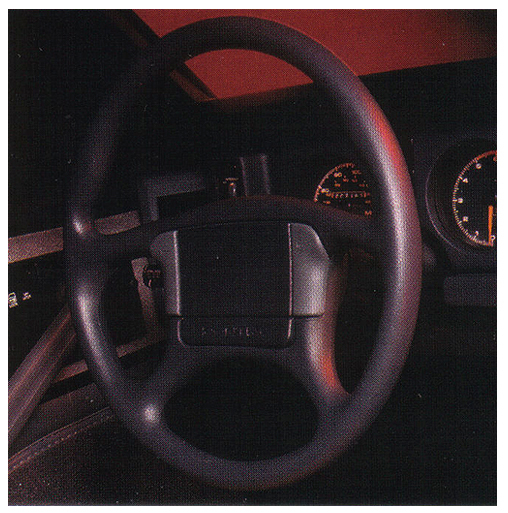 Another interior item that will be an item to check is the various steering wheels used from 1987-1992. 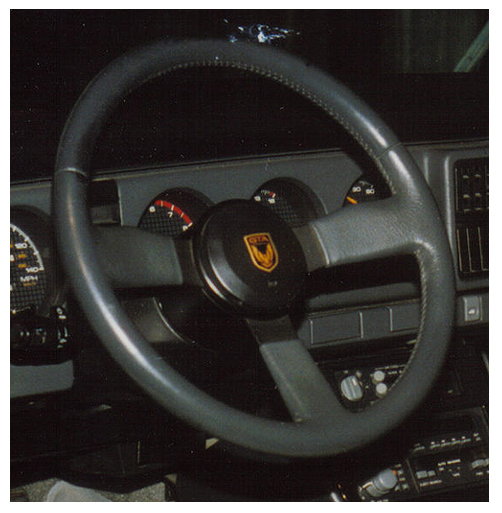 1) The 1987 wheel featured a nice embossed "GTA" emblem on the horn button; the actual wheel was the same three-spoke leather-wrapped unit available in the Trans Am. 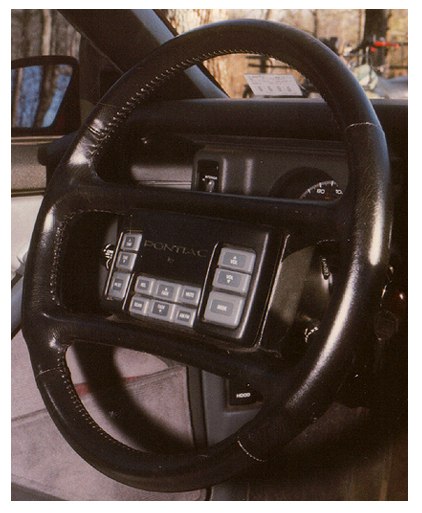 2) 1988 first saw the addition of the RPO UK3 steering wheel hub-mounted radio controls that were standard on the GTAs equipped with the UT4 cassette radio through 1989. Be sure to look for these controls if the car is purported to be one of these models. 3) 1989 also was the first year that GM offered a factory CD player in the Firebird line. Available in all models, cars equipped with this audio option DID NOT use the wheel mounted radio controls. 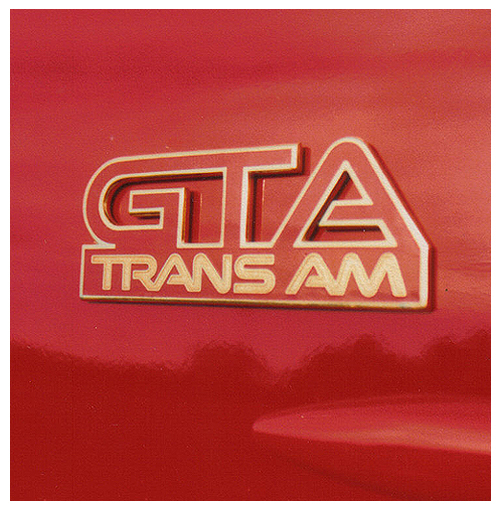 A rare sight in GTAs, PMD records show that only 394 GTAs were built with this optional audio system. 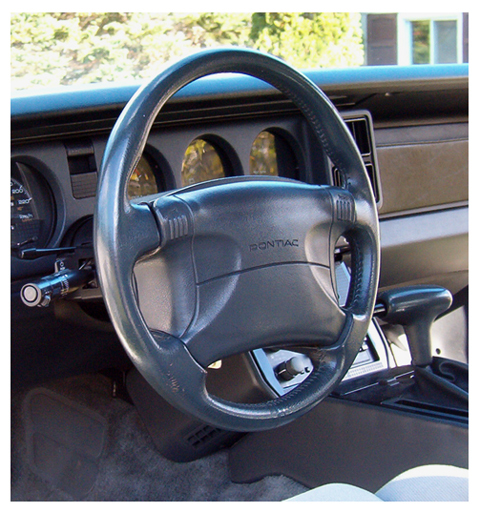 These cars used the standard Trans Am steering wheel as shown above, but wrapped in leather. I've only seen one of these cars out in the real world in the nine years of The Source Page, so they are exceedingly rare.... but you never know what YOU might encounter out in the field. Check for the radio's U1A RPO code if you are not sure of originality. 4) Beginning in 1990, all Firebirds used variations of the same steering wheel, which was equipped with the SRS airbag. 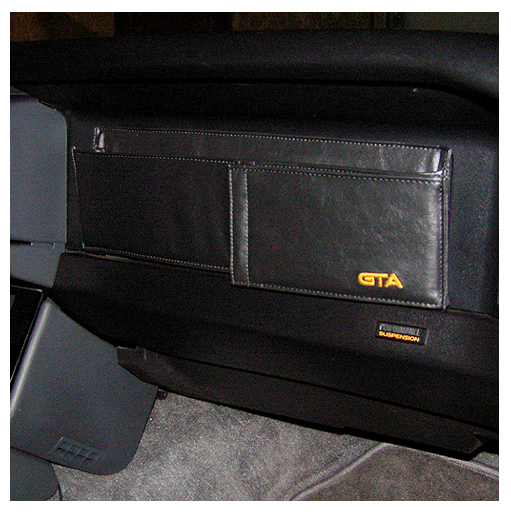 GTA models featured the leather-wrapped model, as before........ all the way through the 1992 model year. So.... there you go. Phew! Hopefully, this section will help out all of you who might be considering buying a GTA and want to know what to look for in order to keep from being taken advantage of. As always, I will make additions to this section as needed. If YOU find something that is not here and you want to check on it, please contact me and I'll do my best to help you out if I can at all. Good luck and happy GTA-hunting..........! COPYRIGHT © 1997-2019, THE GTA SOURCE PAGE.All Rights Reserved.